Many aquarium books tell you that breeding seahorses is a simple thing to do, but that's not true. Only experienced aquarists should attempt this undertaking. For one thing, they need to be fed continuously because they lack a stomach for food storage. Many aquarium books will tell you that breeding seahorses is a simple thing to do. But that is not true. Only experienced hobby aquarists should attempt this undertaking. If you have been able to keep a seahorse couple happy and healthy then chances are you may be ready for this next step. Breeders agree that water quality must be very good to meet the needs of these young fish, but the trickiest part to breeding seahorses is their nutrition. They need to be fed continuously because they lack a stomach for food storage, and for at least two weeks after they are born, they should have food available at all times. This abundant store is necessary so they don’t have to swim far since seahorses, young and old, are awful swimmers. The more they chase for food, the more energy they expend and this results in a low survival rate. Some seahorse breeders leave a weak light on for 24 hours during the first two weeks, when food demands are high. This concentrates both the plankton and the seahorses to the same area, allowing the fry to be within easy reach of their prey. Nevertheless, many hobby aquarists are stumped at why their seahorses die, although all of these demands have been met. This is no big mystery – the answer lies in food quality. Seahorses will only eat live food (although some hard-core aquarists have been able to “train” their adults to eat frozen food). You must therefore have a separate tank set-up in which you can culture your own live food . Mysid shrimp are the best food for seahorses, but these are difficult to come by. Brine shrimp, on the other hand, are easy to find and to raise, although alone they are not nutritious enough to sustain the fry’s needs. However, the quality of the shrimp zooplankton can be raised to adequate levels by feeding them enrichment formula (like Selcon or rotifers) and phytoplankton before you give them to your fry. Feed the baby seahorses the newly-hatched and young brine shrimp (called nauplii) because they are high in fatty acids, which the fry need for growth. Poor vision and difficulty finding prey, worn or mysteriously eroding fins, poor growth rates, mass die-offs, sudden fright syndrome (shock or death when frightened) and high occurrence of disease are all indicators that your brood may be suffering from malnutrition. Studies have shown that the fry do the best with a varied diet, such as an occasional feast of mysid shrimp or copepods between regular fortified brine shrimp feedings. If you think you can handle the demanding nutritional requirements, then you can probably raise a brood of seahorses successfully. Anyone who has done it will tell you the extra effort is well worth it. The mating ritual of seahorses is a spectacular thing to witness. The male approaches the female and settles down next to her. He then quivers to get her attention, puffing out his pouch. The female will then quiver back. They both swim into the water column, often “holding tails” and promenading around the tank. They commonly change colors as they encounter one another. Once they’ve settled down, it’s time to mate. The female lays her eggs in the males pouch. He will wiggle and squirm a bit in order to situate the eggs in his brood cavity. When the eggs are in place, the pouch seals shut until he is ready to give birth. The gestation period can vary; however, the shortest of any known species is about 15 days (for the dwarf seahorse, Hippocampus zosterae). Birth usually occurs early in the morning, but you can tell because the father gets very restless. Some aquarists isolate the male into the nursery tank, although others don’t recommend it saying that it stresses him out too much. When the babies are ready to escape the pouch, already having hatched from their eggs inside, the male experiences what looks like intense labor pains. He anchors himself to something and twists and writhes to force the fry out, sometimes even rubbing his belly against a hard object to shift the brood toward his pouch entrance. 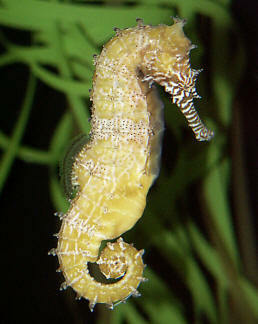 Although adult seahorses do not eat their young, the fry should be isolated into a nursery so they can be properly fed. Catch the fry by using a cup or glass. Do not use a fishnet – at no time should they be exposed to the open air. Watch for more babies one or two days after the initial brood has been born. The first two weeks are the most crucial. The nursery should be a simple setup, and not too large. Be careful about what airstones you use. If the bubbles are too small, the fry will consume them, thinking they are a meal, and die. If you use a good circulation system you may not need extra aeration. A bubble-up or sponge filter and a small power filter should suffice. If you chose to add a substrate or gravel, stick to dolomite, aragonite or crushed oyster shell. This substrate type will buffer the pH of the water and help keep toxins down (if the gravel is already biologically established). Some aquarists say that gravel is not a good idea because it makes cleaning a little more difficult. Ammonia and nitrites should be at or close to nil, and nitrates at less than 10 ppm. Like most marine species, a pH of 8.0-8.3 is ideal and a specific gravity of 1.020-1.024. Know what temperature your species perfers since it can range anywhere from the low-60s to mid-70s (Fahrenheit). Maintain your water quality in the nursery by doing frequent partial water changes, about 25-30 percent every week or so. To save money, you can use this old water for raising the brine shirmp. If you have live rock in the tank, make absolutely sure that no bristle worms and crustaceans are inside. They’ll eat the fry. The baby seahorses need many hitching posts, so make sure to have some holdfasts available in your tank. The precarious status of seahorses in nature due to a rapid decline in the quality of their native environments has made breeding them a labor of love for the conservation-minded Hippocampus fan.